Romanian tenderloin; Romanian steak; Philadelphia steak; Arrachera (Mx). Skirt steak is a cut of beef steak from the plate. It is long, flat, and prized for its flavor rather than tenderness. 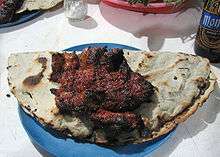 It is not to be confused with flank steak, a generally similar adjacent cut nearer the animal's rear quarter. Both the inside and outside skirt steak are the trimmed, boneless portion of the diaphragm muscle attached to the 6th through 12th ribs on the underside of the short plate. 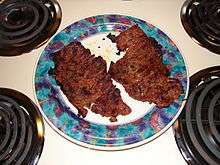 This steak is covered in a tough membrane that should be removed before cooking. The inside skirt steak is often confused with the flank steak, which is the tail of the porter house and T-bone steaks of the short loin found on the flank. It has similar cooking properties. In the United States, the NAMP (North American Meat Processors Association) classifies all skirts steaks NAMP 121. 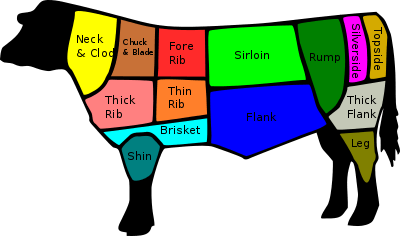 NAMP 121 is further subdivided into the outer (outside) skirt steak (NAMP 121C) and the inner (inside) skirt steak (NAMP 121D). 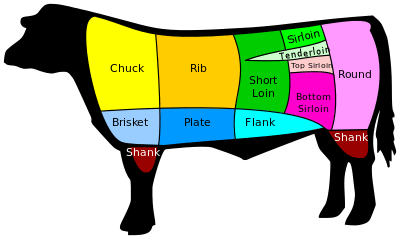 The Beef Flank Steak (NAMP 193) is adjacent to the skirt nearer the animal's rear quarter. Skirt steak is the cut of choice for making fajitas, ranchera, Chinese stir-fry, churrasco and, in Cornwall, pasties. To minimize toughness and add flavor skirt steaks are often marinated before grilling or pan-seared very quickly, or cooked very slowly, typically braised. They are typically sliced against the grain before serving to maximize tenderness. ↑ "Beeffoodservice.com". Beeffoodservice.com. Archived from the original on July 7, 2011. Retrieved 2011-07-21.